Long after the final class ends and the Commencement stage is torn down, students put the granite of New Hampshire in their rearview with their eyes pointed to the real world. Reflection on the past will produce many good memories and hopefully will bring many past successes to mind. But too often, the memory of success has the effect of obscuring or completely erasing the failures. It is imperative to acknowledge that failures are not mere interludes but rather the main events. They should not be forgotten — they are the defining moments. All too many Dartmouth students arrive having never substantially failed. The competitive admissions process allows very little room for it; a high GPA, strong standardized test scores, extracurricular involvement and extensive community service hours indicates high potential — and probably low amounts of sleep. It is no wonder why the Ivy League admissions process favors the “perfectionist” student. Obtaining that standard of perfection is fairly straightforward. There is nothing imaginative about college resume padding. Every step is planned, usually in the early stages of high school. Parental and societal pressure may push children toward particular fields of study or career paths. The rational student, in reaching for these contrived notions of success, is forced to take the safest route possible, so he or she becomes risk-averse and avoids failure at all costs. But this is not right. It is better to take the path laden with risk than to wander the roads worn by countless others. 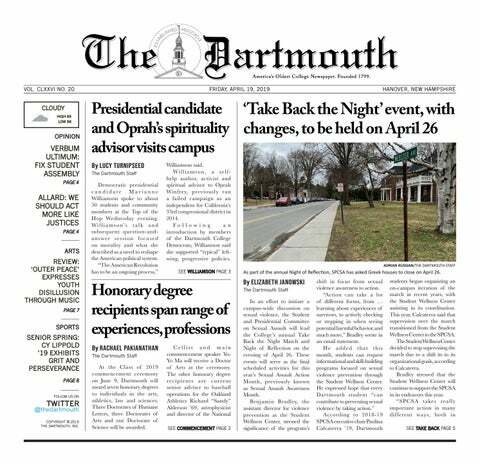 And while the incentive to do that before arriving at Dartmouth did not exist, the College offers a variety of opportunities for that to change. Dartmouth boasts a strong liberal arts curriculum with an intense focus on undergraduate learning. If students want to explore how two areas of study intersect, they can turn those interests into a modified major. Cultural enrichment through programs like foreign and domestic exchanges are made easily accessible with financial aid and careful D-plan selection. And even outside of the classroom, students can chart new paths. Funding is available through the appropriate departments to finance almost any research project or experiential learning trip. The Dartmouth Entrepreneurial Network gives students direct access to venture capitalists willing to invest in start-ups. The Center for Social Impact provides funding to explore personal growth through independently-organized service projects. Therefore, students must take advantage of these opportunities while they are here. It does require a fair amount of risk; one may take a class out of intellectual interest, for example, and end up with a poor final grade. Spending hours on that application for funding through the Rockefeller Center may result in a rejection letter. The research proposal submitted for that history foreign study program may have been too narrowly construed to be supported by archival information, resulting in a complete flop. Even though they sound like horrible cases to be avoided, students should not fear risk but rather embrace it. In the event that the expected result is not realized, the experience of failure is equally worthwhile. Failure is the key for figuring out what does not work, assessing what should have been done differently. But more importantly, it is a time for self-realization — a process which, in turn, produces micro-level innovation. Innovation, then, is not some amorphous, abstract buzzword flouted around in elite circles of “design thinkers.” It is the result of a process grounded in concrete steps taken by the individual to actively pursue failure. When those risks are taken, the seemingly mundane process of trial and error can give birth to the extraordinary. Innovation does not have to only occur on an individual level. If the College can incentivize risk-taking, it can create an entire culture of innovation that is manifested outward in the form of creativity. One way it can do this is by creating spaces for group collaboration. For instance, in 2013, the College established the Office of Entrepreneurship and Technology Transfer to promote innovative partnerships between the school and the private sector. As a result, in 2016, Dartmouth was ranked in the top 100 schools worldwide for number of patents granted, according to the National Academy Inventors. Thus, students who arrive with a passion to invent can turn ideas into actual objects. This innovation has a measurable impact in a global context. The Nature Index 2017 Innovation Supplement ranked Dartmouth 20th out of 200 universities. The index tracks how much research conducted at Dartmouth is cited in patents granted. Dartmouth is the only Ivy League to make the list. Continued investment to incentivize risk-taking has tangible benefits for the College. Indeed, if Dartmouth measures itself as an institution by the amount of change it makes in the world, then it must remain committed to this goal. For the “sons and daughters of Dartmouth,” the “spell on them that remains” must amount to more than a bachelor’s degree. The editorial board consists of the issue opinion editor, the issue editors, opinion staff columnists, the opinion editors, both executive editors and the editor-in-chief.